There are a few fictional settings I just never get sick of, no matter how many stories I’ve read about them: boardings schools, especially if they’re of the mysterious or magical kind (*coughs* Hogwarts *coughs*), desert islands with wicked secrets or the dark and dangerous streets of the Victorian London. Another setting that’s on this „never gets boring“ list are amusement parks and carnivals and that’s what instantly attracted me to H.P. Wood’s novel „Magruder’s Curiosity Cabinet“. The story is set in the early 20th century and mostly takes place on Coney Island, the famous peninsula in New York that has always been well known for its amusement parks and beach resorts and in 1904 it’s the home of Magruder’s Curiosity Cabinet, a strange and a bit shabby tourist attraction that combines an old museum full of odd things and a bar in the basement. While this place rarely belongs to the most popular points of interest on Coney Island, it’s also the gathering place for the workers and residents of the newly opened „Dreamland“ amusement park. You want diverse characters? Come to early 20th century’s Coney Island! And those people are not only what makes Magruder’s such a special place, but also one of the outstanding points of this novel. If you have ever complained about not diverse enough characters and feel that they’re underrepresented in fiction, then „Magruder’s Curiosity Cabinet“ will have you scream with joy because it gives you diversity galore. For example there’s Zeph Andrews, a black man in his early twenties who lost his legs in a terrible tractor accident and now runs the business for his employer Doc Timur, an eccentric scientist who spends his days up on his attic obsessively working on his inventions that often can later be visited in the old museum. Zeph is the heart and soul of Magruder’s but only a small part of the great cast in this book. Another amazing character is Rosalind, a „doublesexed“ (that’s the expression she prefers for herself) character that performs as half man, half woman and has to face a lot of revulsion and hate for her otherness – always struggling for being accepted and being able to live the life she wants. Then there’s Enzo, Rosalind’s Italian lover who immigrated to America where he is now working as part of a fireworks show – a profession that has already cost him half of his face and left him with some ugly scars. Or take P-Ray, a young mute boy who lost his parents and found refuge in the cabinet, or Whitey Lovett, a growth-restricted Jew who works as a fire chief in a Lilliputian show. All those „Unusuals“ are the core of this story and I did not only love that they were so diverse and represent almost every imaginable fringe group but especially how the author never pities them because of their handicaps or social statuses but makes them the heroes in this story while it’s the „normal“ people that stand out for not being special – a circumstance that even „earned“ them the term „Dozens“, deriving from the saying „a dime a dozen“. 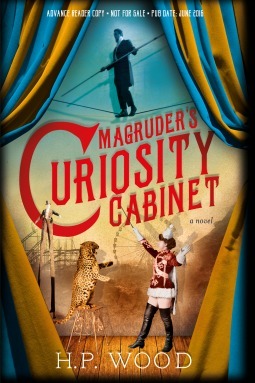 Yes, „Magruder’s Curiosity Cabinet“ is a rather slow-paced story but that didn’t bother me at all. I absolutely loved the atmosphere of this story with the amusement park setting that felt like a weird world in itself full of life and weird characters and interesting places. Also I very much appreciated how the mood of this story slowly got more sinister and tragedy and darkness were added to the plot – let me tell you that this novel is definitely adult fiction despite the young main character. H.P. Wood’s book often reminded me of Libba Bray’s Diviners series and I don’t mean this in a plagiarizing way but rather that it had a similar atmosphere and a comparable „lost souls in a big city“ story where every character had to face its own struggle but found support in people alike. 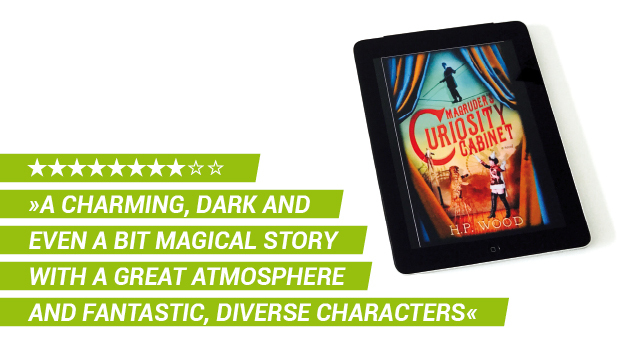 So if you like historical fiction, character-driven stories and wish for more diversity in books, then you should definitely buy yourself a ticket to „Magruder’s Curiosity Cabinet“ and enter this magical place full of quirky characters where you will find a well-written story and a captivating atmosphere. Side note: If you read this novel and afterwards want to learn a bit more about this special setting and the actual historical background of this story, then you might want to visit the author’s website where you can find further and interesting information about her writing process and historical facts and people that inspired this book. H.P. Wood’s novel „Magruder’s Curiosity Cabinet“ takes you to an amusement park on early 20th century’s Coney Island where it introduces you to a bizarre world full of quirky, diverse and lovable characters and tells a charming, dark and even a bit magical story about their struggle against discrimination and racism and for acceptance, respect and love.